With the advancement in gauge technology, digital pressure gauges are becoming more popular. With their superior accuracy and functionality, most new plants are increasingly employing digital gauges especially in industrial processes where accuracy is paramount. Although we probably all know the key parameters required to purchase a regular dial gauge, we may be at a loss when it comes to digital gauges. This is because in addition to the regular features of a typical pressure gauge, digital gauges are equipped with other functionalities that need to be specified. 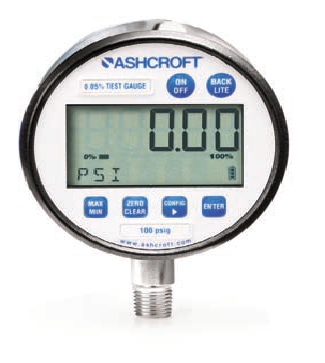 Digital pressure gauges are specified in much the same way a typical pressure gauge will be specified except for few specification items that are specific to digital pressure gauges. The table below shows the key parameters that must be taken into consideration for a general purpose digital pressure gauge to be accurately specified. Case Size Standard case sizes include 3’’, 41/2’’,6’’ etc. Socket Size Typical socket sizes include 1/8’’ , ¼’’ , ½’’ etc. Operating Temperature Operating temperature of gauge is critical for accurate performance. Specify the operating temperature of gauge depending on temperature regime of the environment where the gauge is to be used. Keypad Functions Specify the keypad functions of the gauge. Three key with multi press functionality are typical.